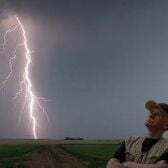 I went on tour 3 last year, me and my sister (Mark and Anna) we didn't see any tornadoes but some nice storm structures and lighting. We went from Texas up to the northern states including Montana, North Dakota, Wyoming and Nebraska as well as some southern states. If you don't see any storms you get to see some nice places and good food. Currently going though probate so next few months not sure what bills I'll be shelling out for, are there quite a few spaces available for 2020? (I can't see availability on the tours anywhere).